And of course, it was interesting to see how some people have tried to build upon the success of ALS and encourage support for their own causes such as the #SunBlockChallenge from BexxFine who does fundraising for the Melanoma Education Foundation. We were nominated on Tuesday and planned to do it on Wednesday (you have 24 hours to accomplish it). But between Tuesday's nomination and Wednesday's execution, I read a post by a friend on Facebook that got me to thinking differently about the whole thing. The debate about whether the ALS #IceBucketChallenge is actual activism or slactivism has created lots of writing and reflecting. There are plenty of examples online wherein the people performing it get it all wrong, fail to mention ALS in their video, fail to donate, or fail to make themselves more aware of what ALS is and the whole reason for the #IceBucketChallenge. This criticism of the viral movement can be understood and has clear similarities to the Kony2012 viral movement. Of course, there are differences here too. Each action (whether you go for the bucket or forgo it) should entail a donation to ALSA and they have reported a significant increase in donations compared to the previous year (currently, well pass double the amount from last year). While some still argue that more time and money are being wasted, I think that's questionable at best. Giving and receiving donations are tricky things and there has to be some stickiness to encourage people to do it. In this case, that people are "nominated" or tagged to do it, that there's some entertainment, and some pressure (24 hours) generates a more rewarding and engaging experience and that's important for both the people donating and the organization. We have this ideal conception of all giving being this altruistic approach with nothing to be gained from the giver but the reward of giving. And while there are kernels of truth in this, we also live in a system (capitalism) that repeatedly tells us that this is not the way to operate and therefore, we often need more than just that good-feeling to motivate us to act charitable. Coupled with this, of course, is the fact that so many different causes pull at our heart-strings, it's hard to decide which ones to pick. The post that my friend posted, struck a chord--not just in me--but in many of his friends as well. In the post, he raised the question about where we should shine spotlights and while ALS is important, it's sometimes hard to recognize the attention that it is getting and how the discussion around mental health and suicide is much trickier to deal or as easily rally people around. 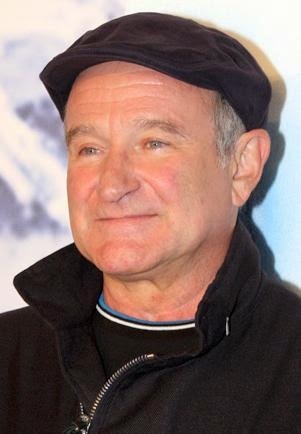 That Robin Williams--a man that made so many people laugh and smile--a man whose movies so often found the inner hope within all of us--should commit suicide is a bit heart-wrenching. It also reminds of that depression and depression-associated suicide is an equally real and tragic experience for everyone around. In that, there's a horribly democratic element to depression that can also make it harder to talk about or create a rallying movement around. After all, if it affects 1/5 of the population, it can be hard to feel like there is much that can be done. It's also a sinister thing, depression. It can lie in the shadows waiting to strike hard directly or suffer the person a thousand little cuts. 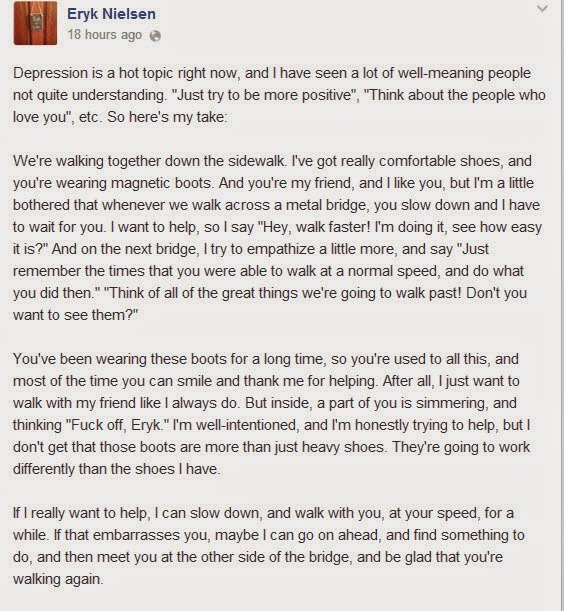 I have another friend who posted the following about depression while writing this post that I thought in many ways got to the center of the challenge. Now for regular readers of this blog (all 2 of you), I've mentioned before about the trials and challenges I've had with depression and suicide attempts. In reading about Robin Williams' cause of death, I took it a bit harder than I would have were it another celebrity in part because Williams was such a centerpiece of entertainment growing up, but also because his roles and messages carried much meaning for me and were often uplifting. One of my favorite movies of his and one that had a lot of impact on me while I struggled out of my depression and suicidal tendencies was What Dreams May Come. It was a film that gave me another way of thinking about death and helped me think differently about a lot of things related to depression and suicide. My friends both connected ideas that were circling in my head and many others out there who were reconciling their experiences or experiences of people they cared about. 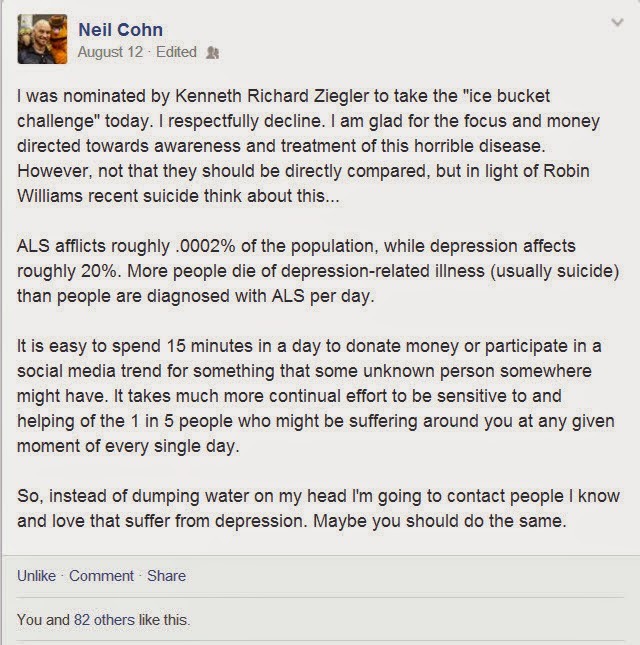 Like Neil, I don't mean to belittle the #IceBucketChallenge but would like to acknowledge the importance of mental illness and the ways it impacts many of us directly and indirectly. To that end, in addition to donating to the ALSA, I also decided to make a donation to National Association of Mental Illness to help find ways of helping others who find themselves unwell and unable to help themselves. I would encourage you to donate as well if you have felt the impact of mental illness in your life. But more than donating, I would encourage you to reach out not just to people who you know have mental illness but just to everyone in your circle. 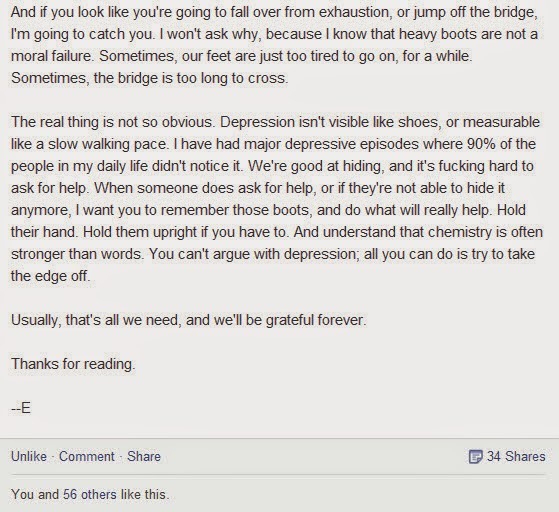 I think one of the biggest challenges around depression, suicide and the like is that it often goes unnoticed. It is often an invisible illness. I know in my own history, it was cryptic at best. I left clues, but at the same time, they were clear clues to me because I knew what I was experiencing, whereas to others, they had little context to understand how that one comment or action was part of a larger pattern--part of a bigger call for help. That is all to say that I have no doubt we all have people who are suffering in some capacity and a friend reaching out to them could be just the something needed to help them out. Finding ways of supporting people we care about in our life is probably the best thing we can do in the wake of Robin Williams' death.